Clark County Sheriff Joseph Lombardo said the dead gunman Stephen Paddock is believed to have checked in as a hotel guest, but did not immediately reveal a motive. Authorities said two on-duty Las Vegas Las Vegas Metropolitan Police Department officers were injured during shooting. One in stable condition after surgery, and the other sustained minor injuries. Two off-duty police officers attending the concert were killed. 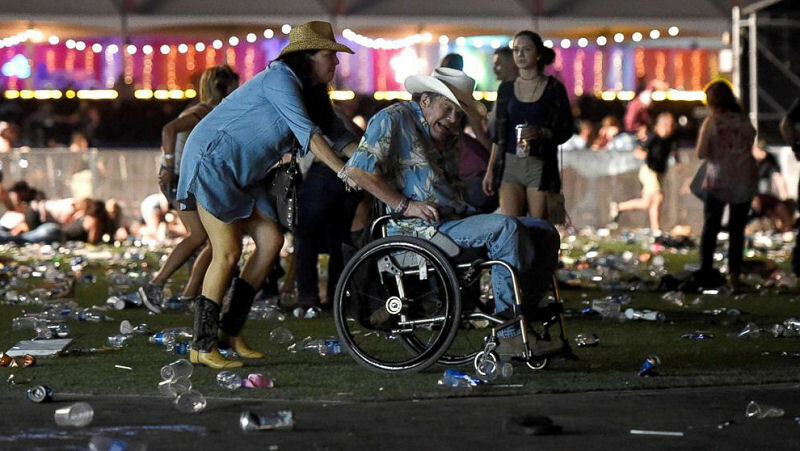 Authorities first received calls about an active shooting at about 10:08 p.m. Country music star Jason Aldean was performing at the Route 91 Harvest Festival when the gunfire erupted. Aldean was performing his last song of the night. Initially, those in attendance said they thought the sound was firecrackers. But as the shots continued, Aldean stopped singing and some concertgoers could be heard yelling to each other to get down. Authorities said law enforcement swarmed the hotel and killed the gunman in a room on the 32nd floor. Responding officers used an explosive device to force the door open into the room to shoot Paddock dead, law enforcement officials said.